The mobile office is a reality in today’s world. According to the Philadelphia Business Journal, telecommuting has increased more than 73 percent since 2005, meaning a burgeoning number of employees are accessing corporate documents and data on their mobile devices. In a recent IDG Enterprise survey, 82 percent of respondents reported that at least some colleagues have completed tasks from mobile devices, whether those devices are managed or not. An increasingly mobile workforce has created a pressing need for electronic access to all enterprise content. And when organizations don’t offer adequate solutions, workers respond by turning to cloud-based consumer file sync and share services. According to a recent Forrester survey, 21 percent of global information workers use consumer file sync and share services for corporate documents. Because these services exist outside controlled IT environments, they expose companies to a myriad of data security threats. IT departments have been forced to play catch-up as they try to regain control of corporate assets and rein in activity outside their networks. 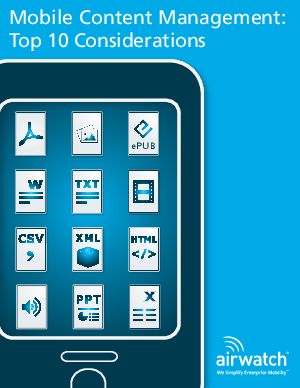 In today’s mobile environment, enterprise-grade mobile content management is a must.